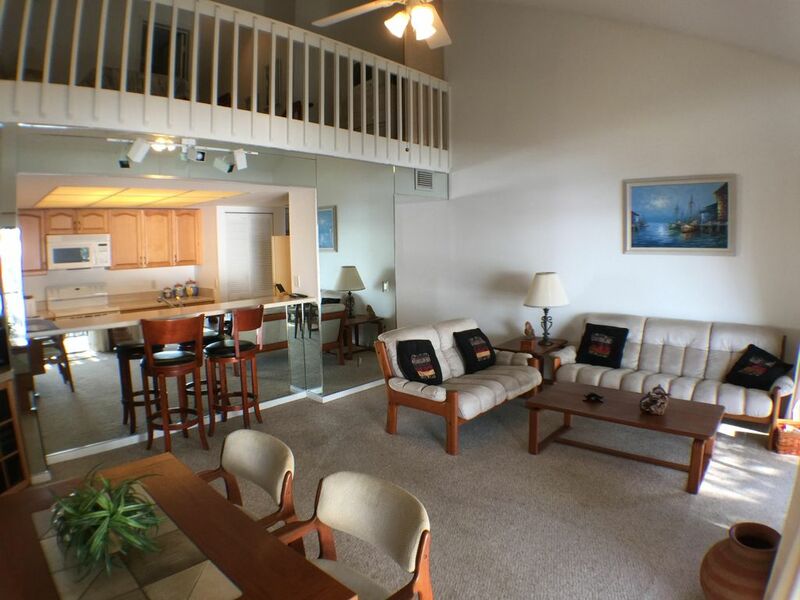 This RIVERFRONT, two-story, loft condominium provides a beautiful view of the mile wide Intracoastal Waterway along the Indian River. Enjoy beautiful sunsets and sparkling water views directly overlooking the river from your private screened balcony. A favorite of vacationers that love golf and waterfront, this popular destination is located in INDIAN RIVER PLANTATION, a full service Mariott resort. The sands and the shore of the resort's private beach are a short walk away, or ride a courtesy resort tram between the Atlantic beach, tennis, golf, swimming pools, and restaurants. YOUR RENTAL INCLUDES THE USE OF THIS MARIOTT RESORT AS A GUEST - 18 HOLE GOLF, PRIVATE BEACH, MARINA, KIDS ACTIVITES, TENNIS, RESTAURANTS, WATER SPORTS, AND MORE! EVEN A HOTEL FOR ADDITIONAL GUESTS. This spacious unit features one downstairs bath, and master bedroom with a King bed and tv, one upstairs bath, and open loft bedroom with two twins and an additional very small bonus room with futon. We provide free wireless internet with the rental. Pets are NOT allowed, No Smoking. Just 45 minutes north of Palm Beach International Airport and only two and one half hours south of Disney World. We are also 10 minutes from Stuart and 15 minutes from Jensen Beach. RIVERFRONT. BEAUTIFUL VIEWS. GORGEOUS SUNSETS. Beautiful view of the Indian River from the screened in patio. I spent most of my days out there, enjoying all the water craft, water sports, and water fowl. The condo was clean and roomy for two and offered all amenities. Plenty of towels, kitchen utensils, bed linens and storage, beach necessities and much more. This condo is so convenient to shops, grocery,beaches, museums, bars and and plenty of places to walk. All the neighbors are extremely friendly also. Jim was very easy to work with and we would love to come back here to stay again. This area is favorable for retirees during this time of year. Enjoyed our second year in this waterfront condo. This year the weather was perfect too. Warm and sunny. We are very comfortable in this unit. We spend most of our time on the porch overlooking the Indian River. We totally enjoyed our stay at Indian River Plantation. The unit was perfect for my husband and me. I really enjoyed morning coffee and evening cocktails on the porch overlooking the Indian River. The unit was fully stocked with enough towels, sheets and other essentials for our month's stay. Was clean and perfect for two people. The location is very nice too. Not far from food and shopping stores and was not as populated as other areas in Florida. Re-booked already for next Feb.
Property is very well kept with an excellent location. Owners are very accommodating. Wonderful location for people with active lifestyles. Nice kitchen with the full supermarket within half a mile. Stuart and Jensen beach have nice reasonably priced restaurants when not cooking in. Great view of Indian River from back porch. Must be minimum of 25 years old to sign contract to rent property.